﻿﻿We predict that an orb with a larger number of Mylar™ strands will float for a shorter amount of time because the more strands of Mylar™ the heavier the orb will be. Get 10 strands of Mylar™ tinsel and tie them together in one knot at one end. Tie again about 10 in. away from first knot. Cut the loose tinsel if its past either knot. Charge 1 inch PVC pipe back and forth through wool 15 times. 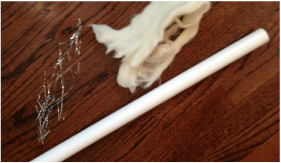 Hold your tinsel by the knot above the PVC pipe ( it should be charged) from a height of about 24 inches and drop it onto the pipe. It should start to float. If it sticks to the pipe the tinsel is not thin enough. You will have to try a different brand. Record the time the orb floats in the air. ﻿Repeat steps 4-8 using 20 strands and then 30 strands. ﻿﻿Certain materials can become electrically charged through rubbing or friction with a different material. When two materials are rubbed together, a chemical bond is formed between the two surfaces, called adhesion, and electrical charges move from one material to the other. Some materials have a tendency to keep extra electrons, and some a tendency to give them away. This is what creates the charge imbalance between the two objects. Different materials will get a different polarity and charge force. For example, wool will charge positively and PVC will charge negatively﻿. In our case, when the Mylar ™ (thin plasticized aluminum foil) orb comes in contact with the PVC pipe, the orb becomes charged by contact, resulting in the same charge as the pipe. Since like-charges repel, the orb will immediately expand to its pre-set shape and levitate.﻿ That is the science behind it. In conclusion, we accept our hypothesis because the more strands used, the heavier the orb becomes so it floats for a shorter period of time, or not at all. When the orb becomes too heavy the charge isn't enough to make it levitate. excellent dancer, survivor of a broken toe; and loves chemistry.